Patients at Northwestern Lake Forest Hospital had to be transferred after a power outage Wednesday afternoon. LAKE FOREST, Ill. (WLS) -- Storms dropped several inches of rain on the north suburbs, causing major flooding, flight cancellations and the evacuation of Northwestern Lake Forest Hospital Wednesday. Some areas received six to seven inches of rain and thousands of people were left without power. In Lake Forest, the flooding forced Northwestern Medicine Lake Forest Hospital to transfer 70 patients to nearby facilities after the power went out Wednesday afternoon. The hospital worked with Northwestern Memorial Hospital and the Lake Forest Fire Department to transfer the patients to Northwestern Memorial Hospital and other nearby facilities, starting with the most critical patients. The hospital said that ComEd restored power to the hospital at 8:45 p.m. The hospital will be closed to clinical operation on Thursday. "Our primary goal is to assure the safety of our patients and staff," a hospital spokesperson said. Chopper7HD flew over the hospital as ambulances lined up to transport patients and ComEd crews worked to restore power. Immediate care centers at Glenview, Vernon Hills, Deerfield and Evanston are open. For more information click here. The storms knocked out power for thousands of ComEd customers. As of 8:45 p.m., 2,500 ComEd customers were still without power, primarily in the far north and northwest suburbs, with scattered outages throughout the Chicago area. ComEd said it has restored power to more than 67,000 customers. To report an outage to ComEd, call 800-334-7661. CLICK HERE to check the status of an outage. A Flash Flood Watch is in effect for northern Illinois, including Cook, DuPage, Lake, McHenry, Kane, Kendall and Will counties and Lake and Porter counties in Indiana until 9 a.m. Thursday. A Flash Flood Warning for for southern Lake, northeastern Kane, southeastern McHenry and northwestern Cook counties in Illinois expired at 5 p.m.
A Flood Warnings remain in effect for areas along Des Plaines and Fox rivers. The Des Plaines River could crest at record levels by Saturday. As of 4:30 p.m., Round Lake Park received 7.13 inches of rain, with Mundelein receiving 6.75 inches of rain and Lake Bluff 5.38 inches of rain. More rain is on the way, with scattered storms moving through the Chicago area around midnight. There is a slight risk that some of the storms could become severe. Chicago airports remained chaotic Wednesday afternoon with delays, flights diverted to other airports or many not taking off at all. As of 5 p.m. Wednesday, the Federal Aviation Administration said 688 flights were canceled at O'Hare International Airport and 18 flights were canceled at Midway International Airport. Metra trains in both directions on the Milwaukee District North Line were suspended between Fox Lake and Libertyville because of the flooding, but service resumed around 2:30 p.m. Commuters should expect some delays to due reduced train speeds in areas hit hard by flooding. A tree came down over the tracks just west of Libertyville, blocking train traffic. The tree was removed later Wednesday morning. Interlocking at Rondout flooded. Once the water recedes, crews must inspect the interlocking and may have to replace the switches. There was a washout near Route 120. Ballast cars and machinery were sent out to lay a new track structure, officials said. On the Union Pacific North Line, inbound and outbound trains were experiencing extensive delays due to flooding problems. Flooding in Lake County and Kenosha County, Wisconsin, also led to an Amtrak track closure, affecting Hiawatha Service trains between Chicago and Milwaukee. Service resumed Wednesday afternoon. Wednesday evening, Wisconsin Governor Scott Walker called up the Wisconsin National Guard to assist in southeastern Wisconsin. I have called up the WI National Guard to assist with the flooding in southeastern WI. Gurnee residents worked together to pack sandbags and protect businesses from flood waters. More than six inches of rain had fallen across parts of of Lake County, resulting in significant flooding that made several roads impassable, the weather service reported. For residents in Lake Forest, relief can't come soon enough. "We've got calls coming in left and right, 'Hey, my basement, my sump pumps, my basement, my sump pumps," said Anthony Javorkcut of Biogi plumbing. The underpass at Route 41 and Deerpath Road was submerged under several feet of water. At about noon, a water main broke in Fox Lake due to a retaining wall collapse in the Leisure Village subdivision, village officials said. Six homes were evacuated. Additional rain could worsen the situation. The water main was turned off at about 1:15 p.m.
CLICK HERE for updated road conditions in Lake County. CLICK HERE for updates on Lake County Facebook page. The Kenosha County Sheriff's Department said as of noon Wednesday, 7.75 inches of rain reportedly fell in the county. The weather service predicted the Fox River will crest Thursday at 15 to 16 ft., exceeding the high level set in 2008. The Des Plaines River rose four feet overnight, Gurnee officials said Wednesday. The river reached 10 feet by 7:30 a.m. and was still rising, shutting down U.S. 41. Around 1 p.m., it was about to exceed 11 ft. and may set a new record. Gurnee went into emergency flood response Wednesday morning. Officials made sandbagging materials available to people who need them at the Public Works Facility located at 1151 Kilbourne Road. The flooding forced theme park Six Flags Great America to close for the day. "Due to flooding in the surrounding area we closed the park today at 1 p.m. The park is not flooded and we plan to reopen as normal for our guests tomorrow," a Six Flags spokesperson said. Officials also asked people to take extreme caution before entering flooded basements, to prevent electric shock. They advised homeowners to call the village or ComEd to have the power turned off before heading down there to check out the damage. Between 7:30 a.m. and 4 p.m., residents should call the village at 847-599-7750. After business hours, residents should call ComEd at 800-334-7761. Gurnee residents stacked and passed along one sandbag at a time. "It's been amazing. We've had tons of volunteers this is only a quarter of them," said Jack Linehan of the village of Gurnee. Truckloads of sand and a call on social media for help. "Absolutely amazing to see what we have the community can come together like this in such a dire situation," said Debbie Krueger of Gurnee Community Church. The goal is to save some local businesses. "Fill bags as quickly as they can and hopefully we'll abate some of this water and save Dairy Queen," said Ismael Rose of Outpost Crossfit. In Mundelein, 30-40 people were evacuated from their flooded homes overnight. Eighteen residents of a senior living facility were evacuated Wednesday and moved to the police station. One of the hardest-hit areas was near North Lincoln Avenue and West Division Street, about a block west of Route 45. Residents were seen walking through flooded streets, cars were stalled in deep water and basements were filled with rainwater. Mundelein resident Diane O'Brien said she has 5 or 6 ft. of water in her home. "A lot of rain. Tons of rain. Kept building up and building up. Eventually there was nowhere for it to go. So it just went down into our basement," O'Brien said. A family of three woke up stranded Wednesday. Ravi Kanasami's apartment on South Walnut Street was surrounded by water, which reached the tail lights of cars in the building's parking lot. "They were very helpful because it was slippery on the road," Kanasami said. Nearby on Huntington Drive, Qadri Abdallah found his two cars nearly underwater. "We woke up to car alarms at 3 o'clock. The water in the middle of the street was 38 inches high. It came up almost to my waist," Abdallah said. His cars were soaked, along with the electronics he left inside them. "My new laptop. My iPad. I had three phones I was going to exchange for my kids," Abdallah said. He put them in trays of rice, hoping to dry them out and get them to work again. The flooding also closed Lake Street between Maple Avenue and Division Street in Mundelein, the Mundelein Police Department reported. For a full list of street closures, visit the Illinois Department of Transportation's website. This is the third time the area has flooded in the Mundelein fire chief's recent memory. Libertyville got hit hard overnight. Water flooded driveways and front yards and poured into basements. "I heard the sump pump running and it didn't shut off. That's when I came downstairs. The water was just rushing into the house through the back door and through the bathroom that we just got done renovating. The whole downstairs - we live in a quad level - the whole basement - there's at least 3 to 4 ft. of water that's still coming in right now," said Mary Tiegs, who lives in Libertyville. Tim Olk, who works for United Services Board Up, ran from call to call Wednesday morning. "We're getting a lot of calls for flooded basements from windows that have been overcome by large amounts of water. Windows are breaking out, so we're going around boarding up the windows to try to minimize any more water from coming in and doing more damage to their basements," Olk said. Officials in Libertyville declared a state of emergency because of the flooding and ask residents to be careful with utilities and flooded basements. Standing water had closed several roads in Libertyville, including U.S. Route 45 between Peterson and Casey roads and Buckley Road between Milwaukee Avenue and St. Mary's Road, Libertyville Fire Chief Rich Carani said. There was also flooding near East Rockland Road and 4th Avenue, but after the rain stopped and the storms moved out onto Lake Michigan, the water seemed to recede quickly. Carani asked residents to stay away from standing water. Crews planned to barricade dangerous areas. But before he could spread the word, many drivers were stranded. Chopper 7HD was over the scene around 6 a.m. A woman was stranded in water over her tires along Route 137 and River Road. After waiting more than 10 minutes, she climbed out of her driver's side window. She landed in water that came up over her knees and waded to dry ground. At least seven vehicles were stuck in high water, but all of the occupants were removed safely, Carani said. In Round Lake Beach, people became trapped inside their homes, with water on all sides. Emergency works and other neighbors had to use canoes to get them out. Residents said it was around 1 a.m. when they started to see the water rising as a nearby pond overflowed and rushed toward one neighborhood. "I started talking to the neighbors, started moving cars, get them up them up the driveways and the streets and out of the water. As the evening started moving on, three, four o'clock it's still rising and rising and rising," said Round Lake Beach resident Rob Redfield. Elsewhere in town, rushing water poured across streets and into homes. One neighbor seeing the fish go by joked it might not be a bad day to bring out his pole. "When you get limes, make lemonade. Why not enjoy it. There's nothing you can do about it. What are you going to do? Wait till it comes down and hopefully we can get the water out, go on and do some repairs," said Michael Cordova. Flooding closed several streets in Highland Park, officials said Wednesday. "City crews have been here since 5 a.m. addressing all the flooding calls we are been getting, including any tree removal calls. Right now we've blocked the street to ensure residents are safe," said Highland Park Public Works Director Ramesh Karapareddy. Residents whose streets are flooded should call Highland Park Public Works at 847-432-0807. In case of an emergency, residents should call 911. Ofer Meged, who works for an emergency response service, tried to get down Parkside to deliver pumps, but thought twice about it and backed up. "People are just hopeless. Water is pouring in and they don't know what to do," Meged said. "I'm going to deliver some pumps to maintain certain water levels in the basement so it doesn't go all of the way and shut off the power into their electrical services." Shira Gaule said her son found a silver lining Wednesday. "He's having a great time. Begged me to come out, even when it was pouring rain this morning. We waited until it calmed down a little bit," Gaule said. Highland Park officials also said garbage and recycling pickup will continue Wednesday in areas that are passable. Residents who require special pickup should call Lakeshore Recycling Systems at 773-685-8811 and indicate what type of materials will be at the curb. Grayslake Mayor Rhett Taylor said in a statement Wednesday that the north suburb experienced a "100-year flood" event after more than 4 inches of rain fell in less than three hours. He reminded residents not to drive through standing water, to watch for uncovered manholes and said not to enter flooded basements. Village crews worked to clear drains and barricade flooded streets as needed. A special pickup schedule will be sent out for residents who need to get rid of storm-damaged items. CLICK HERE for pickup updates. Algonquin Towne-Park was closed Wednesday, after the creek overflowed into the park. Officials said an alert will be sent out when the park reopens. The College of Lake County cancelled evening classes with a start time of 2:30 p.m. or later and all three campuses, including Grayslake, 19351 W. Washington St.; Lakeshore Campus, 33 N. Genesee St., Waukegan; and Southlake Campus, 1120 S. Milwaukee Ave., Vernon Hills, will close at 4. Overnight storms also created a mess in Fox Lake. First responders brought a small boat to communities were several homes were flooded. A Flash Flood Warning went out on mobile phones to advise residents of what to do in that area. High winds from the storms overnight knocked down trees and power lines, causing power outages in northwest suburban Elgin, the city said in a statement. The area between the Grand Victoria Casino and Liberty Street was affected by power outages, as was the area between Wilcox Avenue and Liberty south of Walnut Avenue. Flood waters trapped people in their homes and stranded motorists Wednesday. The danger from flooding is real and potentially deadly. Yet, throughout the northern suburbs, drivers were seen driving through high water and becoming stranded in flood waters. Lake County workers are using 375 cameras to track flooded roadways. "The most important thing is don't drive onto flooded roads - that's the number one safety issue and safety message for today," Lake County Storm Water Management Director Mike Warner said. In suburbs like Mundelein and Lake Bluff, drivers forced their way through the water, but the threat is real, even deadly. In fact, the National Weather Service reports that 50 percent of flood-related fatalities are drivers. It only takes 18 inches of water to float most vehicles and some understand the risk. "I've seen people getting stuck in the middle. Not me. Not today," said driver Eric Mejia. Last year, flooding was deadly, killing more people across the country than any other weather-related event, including tornadoes, hurricanes and lightning. One hundred and twenty six people died in flood waters, followed by 94 heat-related deaths. Rip currents claimed 58 lives. In Lake County, they're watching, and workers understand the threat isn't over. "We have seen a lot of water today. We have many roads have been flooded, some have receded now, which is great. Other roads are still going up," said Lake County Traffic Engineer Jon Nelson. They just want every driver they see to make the right decision. "I need to go that way and it's going to be finding an alternate route is probably going to be extremely difficult," said driver Sam Juenger. 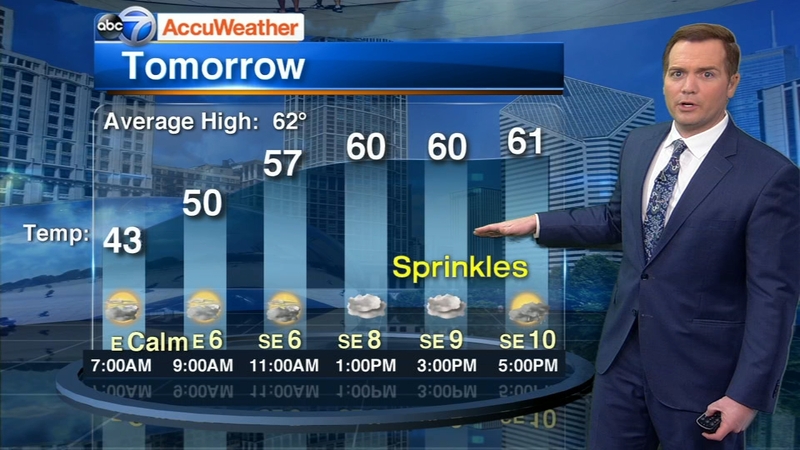 Mostly sunny and cool with sprinkles Wednesday. Highs in the low 60s.